There have been times when I dig a shirt out of the closet and put it on. Then I smell it and think, "oh my gosh. WHAT is that smell?" Yeah... You know what I'm talking about. It's the closet smell. That smell that we don't want to carry around with us, so you take the shirt off and wash it again. 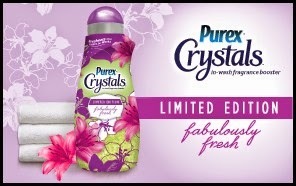 I don't have this issue anymore as Purex Crystals has come out with a limited edition of their in-wash fragrance booster! New Purex Crystals Limited Edition Fabulously Fresh is the latest Purex Brand laundry enhancer bringing a fresh sensation to your laundry experience. This limited edition bottle and scent will add a colorful escape to your laundry day! Being a part of the Purex Insider's program has turned me onto new products, leading me to switching brands. That is exactly what happened with Purex Crystals. I used to use Downy Unstoppables, but no longer. The scents are different and I feel like Purex Crystals last longer after the wash. My clothes feel softer and all around I just feel better after using the fabulously fresh Purex Crystals! 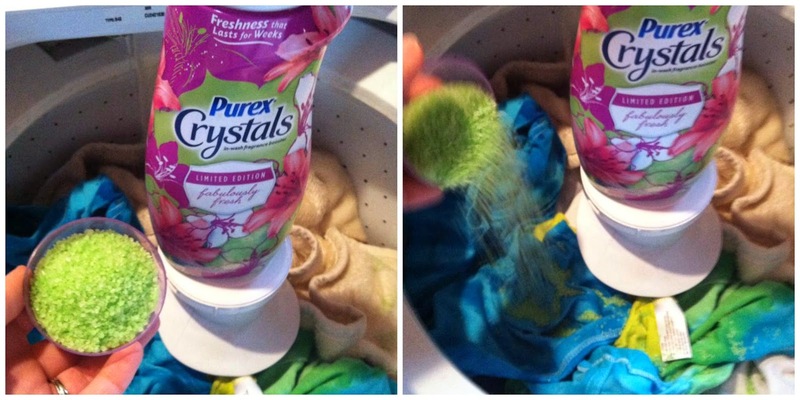 As you can see, the Purex Crystals are easy to use. Add them to the load of wash on top of your clothes. Let the crystals do the work after you close the lid! When the load has finished, you'll enjoy the fabulous scent coming out of your clothes! Now that you've heard how much I am enjoying Purex Crystals, want to win a few coupons for your own bottle of Purex Crystals!?! Dates: Starts April 22, 2014 3:00 pm EST. Winner will be chosen May 2, 2014 11:59 pm EST. I have always liked the lavender scent to added to detergent. I've never added scent to my laundry. I'd like to try. Honestly I have not added scent to my laundry before so I would love to try these!! Thanks!! love fresh laundry scent, lavender, sunshine scents.. I add Purex Crystals for baby. I'm completely addicted to that scent!! I have used a lavender scent that was nice but would love to eventually find a vanilla scent. I think that would be awesome! I have used the Fresh Mountain Breeze and the Fresh Spring Water, I would like to try the Limited Edition Fabulously Fresh too.